I know, I know, there is more than one blog post about unusual traditions here, but there are so many of them and they are so much fun to listen to. Who doesn’t like being told about a totally surprising or creepy custom? It’s like when you were a little child and liked being told stories about far-away places filled with strange characters doing the most extraordinary things. Well, this is how I feel when people tell me about unusual customs around the world. So, whenever in the textbook I am following there is a slight reference to unusual traditions, I jump at the opportunity to do something with it. A video about unusual customs with Ellen Degeneres telling the story. By the way, one of them a surprising Spanish custom I didn’t know about. The quiz : What nationality are your manners? Display the picture below and ask students in pairs to comment on it. After a couple of minutes, get feedback. There is always someone who has read or knows a bit about this custom, mainly because every single time a member of the British Royal family goes to New Zealand this is the most popular picture to take. In case they know nothing about it, you can tell them this is the Maori way of greeting people, called Hongi. It is used at important ceremonies. Through the exchange of this greeting, one is no longer considered a visitor. If you have been reading this blog for a while, you’ll probably know that I’m a big fan of Ellen Degeneres. Write her name on the board and ask students if they know who she is. Tell students they are going to listen to a short extract from Ellen Degeneres show about Odd Traditions around the world. Note: I have only used the first two traditions (0:00- 2:06 ), the third one is way too weird for my taste. Write Groundhog Day on the board. Tell students this tradition will be mentioned in the video, but they will learn more about it in the next activity. There are no questions here. The first time you play the video, students will be required to write down the names of the two festivals. The second time, they will have to explain everything they have learned about the two festivals. Reading about Two Unusual Traditions. Retelling. Ask students to work in pairs. Student A will get a copy of Groundhog Day (American tradition) and Student B, a copy of Guy Fawkes Day (British tradition). Give them some minutes to read it a couple of times and then, in pairs, ask them to tell their partner about their tradition in as much detail as possible. Speaking: Giving a short speech about an unusual celebration. The only thing probably worth mentioning here is the fact that we have used Google Slides to work collaboratively. I am a very visual person. I do not want to imply that listening to my students’ speeches is boring, but I cannot deny that it is much more pleasant to look at some pictures of the tradition being described, while listening to the students’ performances. Problem? Every student will bring their own flash drive, we will need to Insert the flash drive into the USB port on the computer, run a virus scan …. etc and this takes time. A lot of time. Solution? I created a Google Slides Presentation, used the first two slides to give instructions and then wrote the names of my students on the slides. One slide per student. I shared the URL with Edit permissions and asked them to, instead of their name, write the name of their festival and then insert a picture below it. Problem solved. A speaking Activity Using the Quiz: What nationality are your manners? This fun quiz contains some very interesting questions which can spark a lot of discussion in the class. Do the quiz with the whole class. Display question number 1 and ask a student at random to choose the answer that is true for him. Ask the whole class to discuss some of the other options. I hope you have enjoyed the lesson! Raise your hand if you have never seen Michael Jackson’s Thriller video. No hands? Right! Just what I thought! You might like it or not, but what is undeniable is that this video has become a classic. 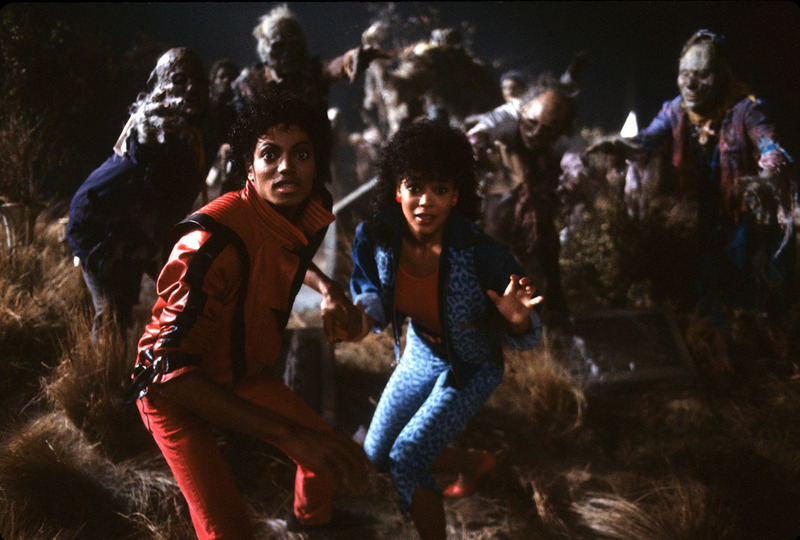 I was racking my brains about the activity I could give my students for Halloween this year when suddenly the image of the undead rising out from their graves in Michael Jackson’s “Thriller” appeared in my mind out of nowhere. Yeah! I know! Weird! A spooky video but also a masterpiece. I hope you enjoy the activity and also the homework. Do you believe in ghosts? Do you know any stories about ghosts? Has anything ever happened to you that you cannot explain? Do you believe that vampires or zombies exist? What is the most frightening experience you have had? Pdf of the lesson here. Ask students if they know who Michael Jackson was. Can they name any of his songs? Most probably students will know who Michael Jackson was and will probably mention the song “Thriller”. If you deem it appropriate, give students some information about this video, like for example, that it was voted the most influential pop video of all time. More information about the video here. The video lasts about 13 minutes. It is going to be divided into two parts, with a different task for each part . Tell students they are going to see the first part of the video where there is a dialogue between Michael Jackson and his girlfriend. Half the class will take Michael’s role and half the class the girl’s role. Have the students work in pairs. Half the pairs in the class will write down the part of Michael Jackson and the other half the part of the girlfriend. I suggest you give students the beginning of the dialogue as M. Jackson’s first sentence might be difficult to understand. Jackson: Honestly, we’re out of gas. Girlfriend: So, what are we going to do now? You might need to play it twice. Pair students once again, this time you want to pair a student with Michael’s part and a student with the girlfriend’s part. Ask students to act it out. Write/display the following words on the board and ask students to guess meanings. Explain if necessary and drill pronunciation. Play the song and ask students to fill in the gaps with the words in the box. Words can be used more than once. Students complete task 1 and try to fill in the blanks for the words in phonemic transcription. Check and listen again to enjoy the video and maybe… sing along? I am well aware that I won’t be able to check this homework and I am also pretty sure my students, which are all adults, won’t be volunteering to show how much they have learnt from doing this homework, but I guess that at home they will be having a great time and that’s important too. Enjoy! Blog de Cristina is also on Facebook. Click to follow. Wanna sing along with Rihanna?